Ukraine's protesters have offered the Verkhovna Rada to approve Batkivschyna Faction Arseniy Yatseniuk as the prime minister. 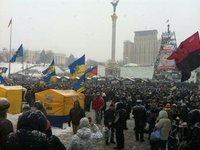 A relevant proposal was voiced from the stage on the Independence Square, known as Maidan, at the people's council on Wednesday. Borys Tarasiuk is proposed for the post of deputy prime minister for European integration, Yuriy Prodan for the fuel and energy minister, Dmytro Bulatov for the youth and sports minister, Andriy Parubiy for the secretary of the National Security and Defence Council, Oleksandr Shlapak for the finance minister, Pavlo Petrenko for the justice minister, Pavlo Sheremet for the economy minister, Serhiy Kvit for the Education and Science Minister, Oleh Musiy for of the health minister, Liudmyla Denisova for the social policy minister, Andriy Mokhnyk for the ecology minister, Andriy Deschytsia for the foreign minister, Oleksandr Myrny for the agrarian policy minister, and Ostap Semerak for the minister of the Cabinet of Ministers. In addition, Olha Bohomolets was suggested for the deputy prime minister for humanitarian policy, Volodymyr Hroisman for the deputy prime minister for regional policy and Oleksandr Sych for another deputy premier. Maidan also proposed approving Arsen Avakov as the interior minister. The consultations for the appointment of Leonid Kostiuchenko as the minister of infrastructure continue.